View More In Stud Finders. 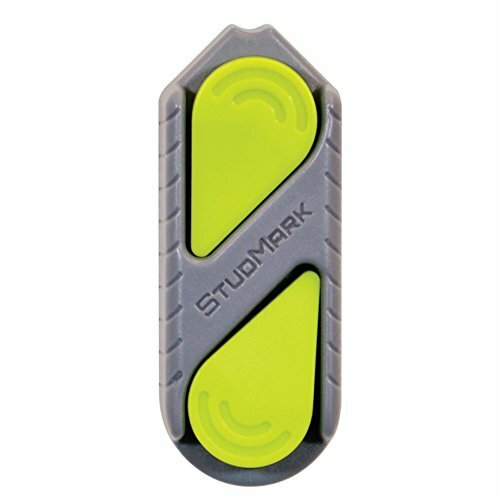 Equipped with super-strong rare-earth magnets, your StudMark Magnetic Stud Finder lets you visually mark up to 3 stud locations. Has 2 removable magnet markers built-in. No batteries needed. Had it with hard-to-use stud finders that don't really work? Tired of marring your walls with messy pencil marks? This compact magnetic stud finder takes the guesswork out of stud location & eliminates the need for excess pencil marks. Ideal for finding studs in ½”, 5/8”, ¾” drywall & sheetrock walls. Once the 2 green markers are in place, you can use the StudMark base unit itself to mark a 3rd stud location. No more leftover pencil smudges. No more needless nail holes. No more fuss & frustration. Perfect gift for all the do-it-yourselfers & construction pros you know. HANDS FREE OPERATION: When this quick & easy stud finder locates a stud nail or screw, it sticks right to the spot, so your hands are free to work. REDUCE MESSY PENCIL MARKS: Since your stud locator & markers attach magnetically to your wall you'll rarely need a pencil to indicate stud positions. COMPACT SIZE: Your sturdy new stud finder fits easily in your shirt pocket or nail pouch. Powerful rare earth magnets hold markers securely in place. NEVER NEEDS BATTERIES -- WARRANTY: Reliable and dependable, StudMark has a 2-year warranty covering any defects in workmanship.